The Google Enterprise channel broadcasts content around smarter working, online collaboration tools, information management, and corporate communications. 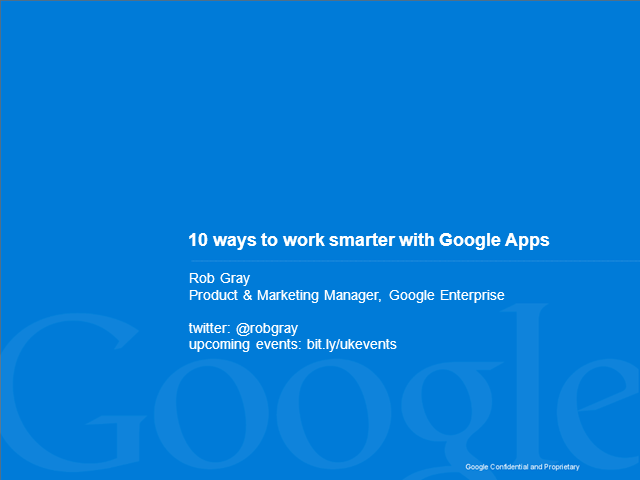 In this 15 min "snack time snippet", Rob Gray from Google will share 10 tips to working more productively using Google Apps. Jaguar Land Rover will talk about their move of over 15000 staff to Google Apps, resulting in savings of over £1.7m but also enabling new ways of working. This session is moderated by Angela Ashenden, Principal Analyst at MWD Advisors.